Furniture Maven: Take your relaxation seriously! The Comfort Recliner™ features the Infinity System, a personal, infinite-position system that adjusts to your exact comfort needs. Download our brochure or read below to discover why the Comfort Recliner is all your recliner wishes come true! Now you can lean back and relax without having to engage the ottoman thanks to the Comfort Recliner’s independent back and footrest. When you recline, the weight-balanced mechanism moves with you, so you can lean back almost effortlessly, no need to push on the arms. The amount of resistance in the back can be adjusted using two hidden tension knobs located beneath the chair. A FOOTREST THAT’S BETTER THAN OTHER RECLINERS. The Comfort Recliner’s gas cylinder-assist footrest stops in any position without clicking or ratcheting. Pull the stainless steel lever to raise the chaise-style ottoman to your desired position. In the open position, the chair has an elegant footrest extension that hides all mechanical linkages and accentuates the full-length ottoman. The solid, one-piece ottoman provides over 20” of support, several inches longer than the industry standard. The Comfort Recliner headrest adjusts in two ways to get you to your perfect position. Find the ultimate movie-watching position by pulling the back forward. And for complete head and neck support, a simple up and down movement adjusts the headrest height without any visible hardware. In the quest for ultimate personalized comfort one size does not fit all. Every Comfort Recliner™ is available in the Infinity 3, the Infinity 5, the Infinity 7 or the Infinity 9 to accommodate the differences in height, weight and personal preferences. Try all four sizes and pick the perfect chair for you. DESIGN YOUR PERFECT LOOK TOO. American Leather offers a wide range of fabrics and leathers. Our leather is among the finest in the world: full aniline dyed for beauty, softness, and a supple hand. We offer hundreds of fabric options including designer prints, family and pet-friendly fabric and the popular Ultrasuede®. You can also choose from a variety of base options. The height-adjustable round base is offered in stainless steel, three wood finishes, or upholster it with any fabric or leather. For a more traditional look, choose the four legs option, available in Walnut, Acorn, and Espresso finish. RELAX WITH A GREAT WARRANTY. American Leather provides a 10 year warranty on the internal mechanism and lifetime warranty on the frame of the Comfort Recliner. We are proud American Leather authorized retailers and have all contemporary styles and all sizes represented in our showroom. We have all fabric and leather swatch options in the showroom and a large leather wall with larger leather swatches we can drape over the furniture as you make your selection. 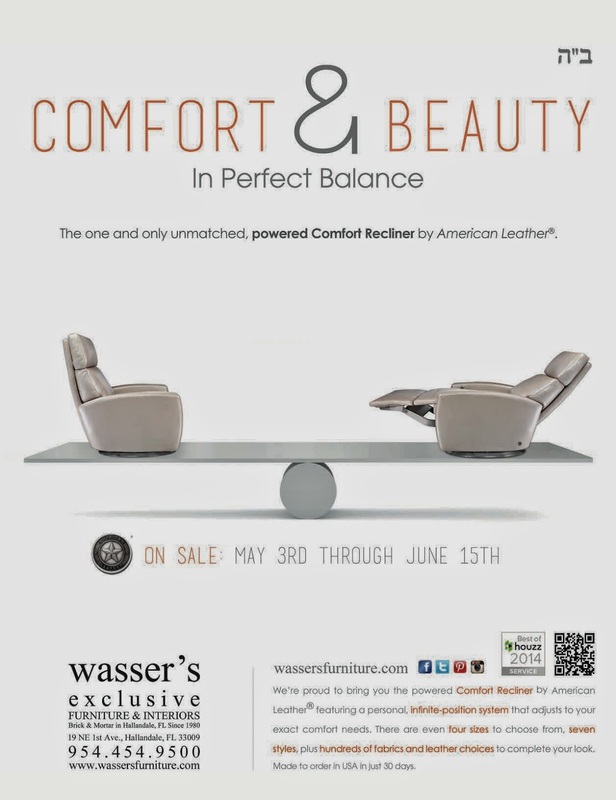 Come visit us during the sale to experience the ultimate comfort of the comfort recliner, find the perfect size for you, or even to get a pair of HIS & HERS comfort recliners in personalized sizes but matching style & color. Great addition to any living room or perfect bedroom chair for reading and relaxing.